A thick blanket of clouds clung to the top of St. Mary’s Basilica as we cut through Rynek Głowny in the middle of Old Town, Kraków. The weather had turned heavy almost immediately after my friends David and Sara arrived in Poland, but that morning no one had much to say about the dreariness. 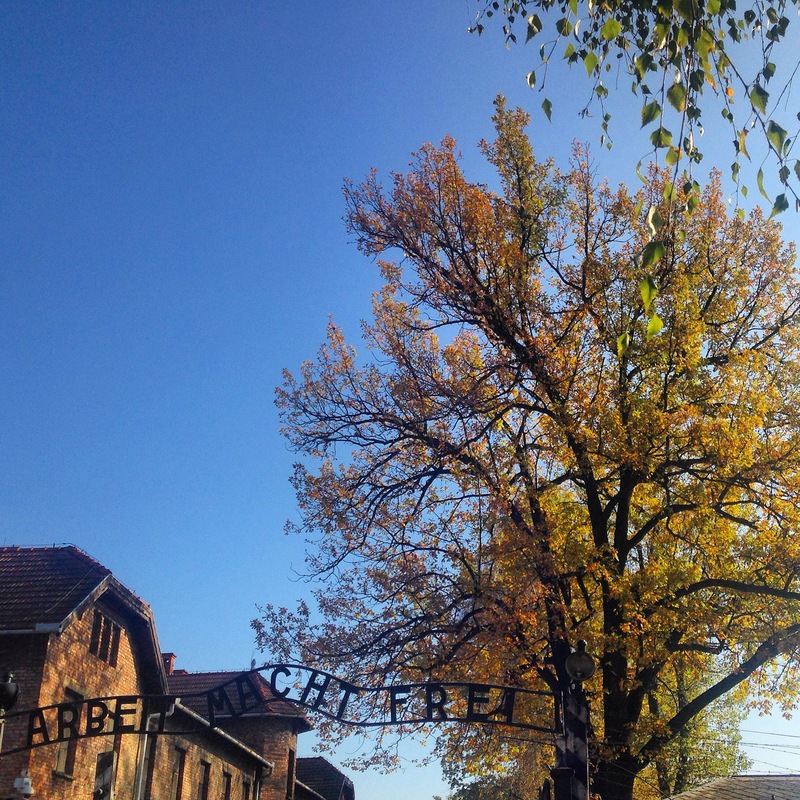 After all, it seemed as good of day as any to visit Auschwitz. 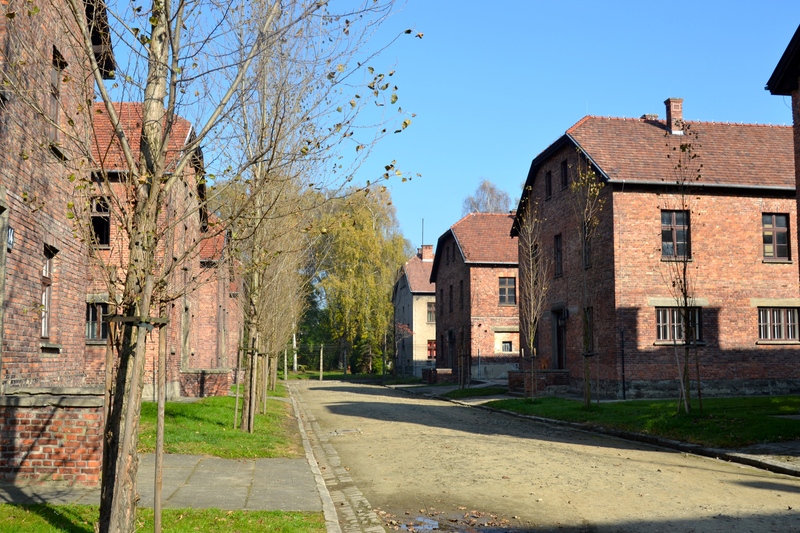 But a strange thing happened as we approached Oświęcim, the unfortunate industrial town bordering the ugly barbed-wire fences and cold brick buildings of the concentration camps. The sky pulled back its thick grey blanket, unveiling intense blue skies and warm, yellow sunshine. All traces of fog vanished. Actually, it was the most perfect day. 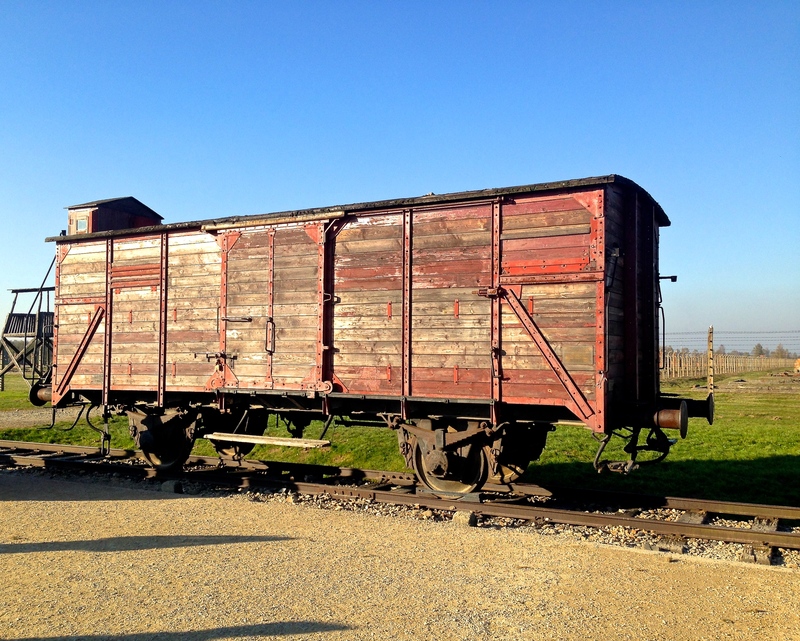 As we pulled into Auschwitz, I immediately felt guilty for even thinking that. We slowly walked under the metal gate inscribed with the infamous phrase Arbeit Macht Frei, translated from German as work sets you free, as our guide began her informative routine, one she probably does several times a day, multiple times a week, every month. Later, David sadly wondered if she ever had the pleasure of going home from work happy. It certainly seemed she might have more of a challenge than most. I listened to the horrors of history as we wandered down wide dirt paths between the barracks, becoming overly conscious of my camera, desperately conflicted about photographing anything. It felt wrong, disrespectful. Not only was I not sure if I should take pictures, I didn’t know if I even wanted to. Like taking pictures of a deadly multi-car pileup on the highway, or the aftermath of a natural disaster that totally destroyed a town, or any situation where innocent people suffered the unthinkable, but on a much larger scale, with an astronomical horror value. 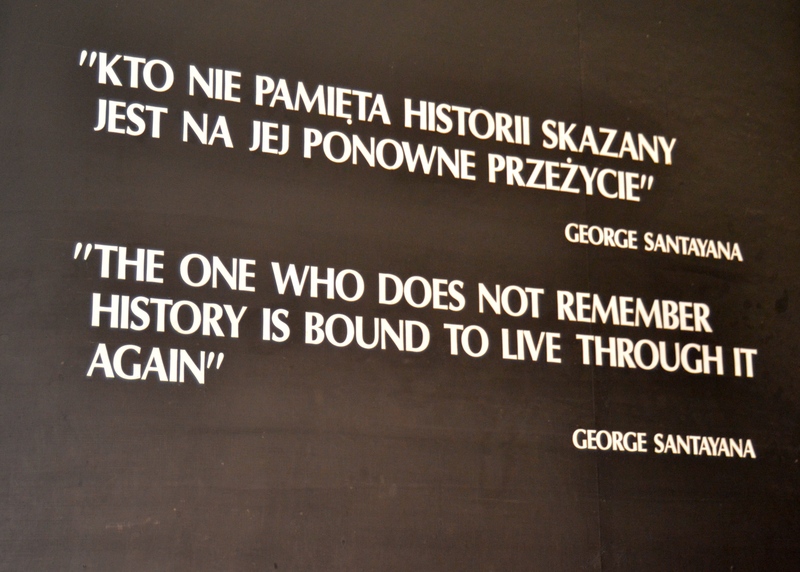 But the first barrack we entered held a plaque with these words: “The one who does not remember history is bound to live through it again.” Mr. Santayana helped me find the appropriateness to take fifteen general (i.e. 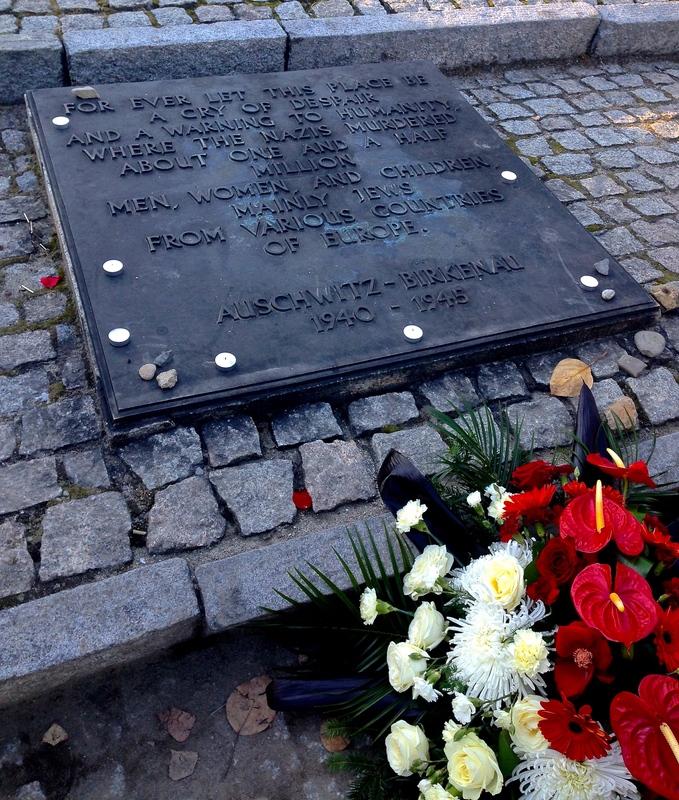 as “generic” as possible, so as not to disrespect anyone who suffered through these horrors) photographs between Auschwitz I and II, and the ability to forgive those around me deliberately ignoring the few places posted signs politely asked, please, no photos out of respect of those who lost their lives. Our guide lead us in and out of the maze of rooms and museum displays within the barracks. Some were set up as living quarters of cell block overseers, others displayed items meant to depict the everyday life of a prisoner (meager food rations, prison uniforms, living and sanitary conditions). Still others contained overwhelming heaps of discarded eyeglasses, pairs of shoes, named suitcases inscribed by the hopeful hand of the owner who was told it would soon be returned; all things stripped from prisoners as they were forcefully transformed from people into numbers. One particularly disturbing room displayed mounds of hair the Nazis shaved off prisoners and repurposed in a variety of ways. 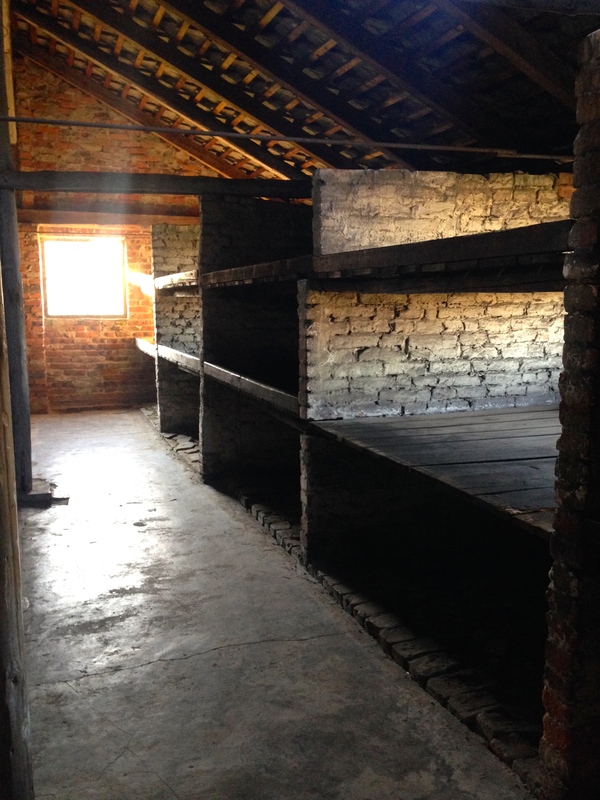 One of the blocks in the long row of barracks at Auschwitz I. 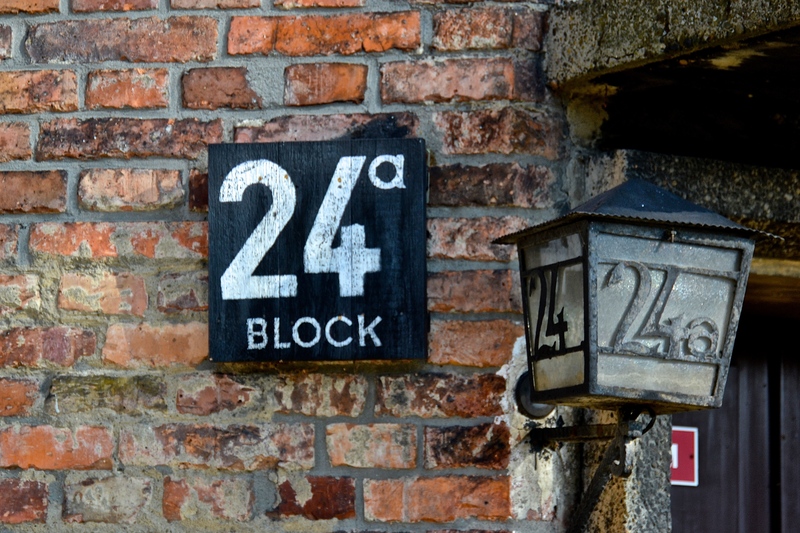 Many blocks were infamous for their purpose, this one served as a camp library and brothel. But this isn’t meant to be a history lesson. 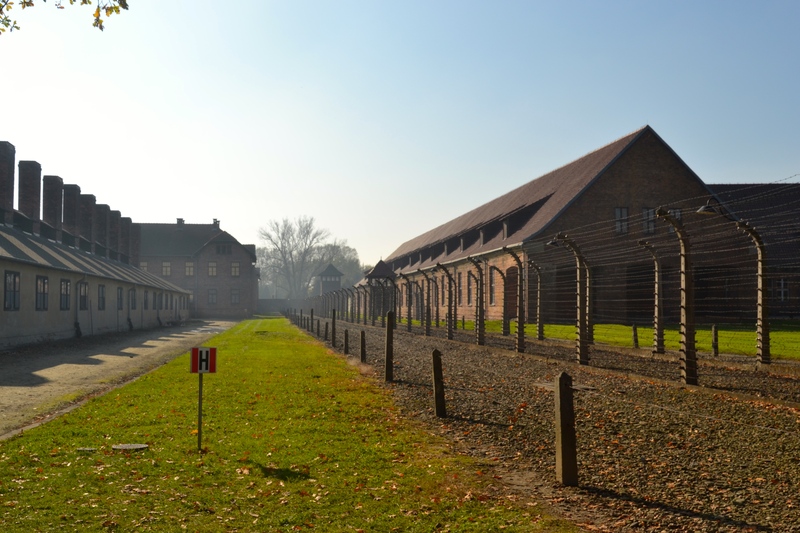 If you are reading this, I assume this means you can read and use the internet, but more importantly, your superior judgement in reading material leads me to believe you can also use your own critical thinking skills and sense to learn about what took place at Auschwitz. You don’t need me to tell you. Watch documentaries, read books, watch all the Hollywood movies even. 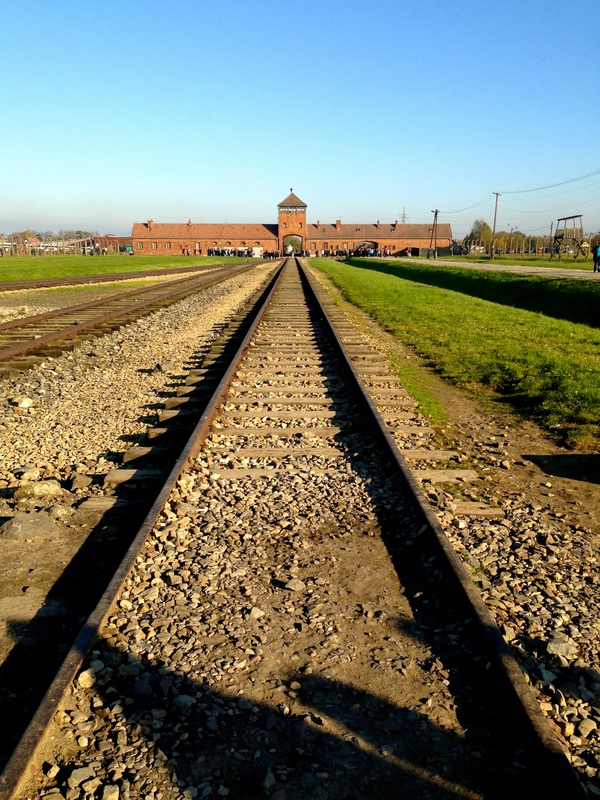 Or, if you’re able, go to Poland and experience firsthand history. I had no guesses on how Auschwitz would affect me. Throughout the entire tour, I tried to put my finger on what I was feeling, to identify with any emotion. I couldn’t place it then, I can’t place it now. Incomprehensible? Inconceivable? Unimaginable? All the words in the thesaurus? It was like my brain was trying to connect the knowledge I was ingesting, the images filing to memory without my permission, the emptiness of unknown origins, directly to Human Beings, and the ends repelled from each other like similarly polarized magnets. And I believe there will always be that disconnected distance for me and for you. Only those unfortunate enough to die, escape or survive these camps are able to penetrate that pressurized space between the magnets. 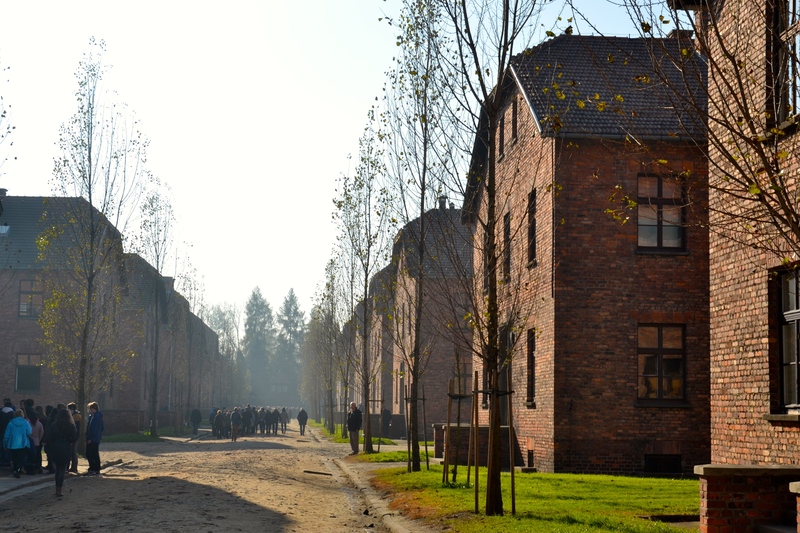 One of the barracks in Auschwitz I is lined with the names and photos of those who lost their lives at that camp. Our guide told us a story of an elderly tourist in her group back in the 90s who recognized his mother on that wall and asked for the photograph, as he hadn’t anything to remember her by. Overwhelmed by the sea of sad faces and familiar last names, Lewandowski, Novak, Grabowski, I hesitantly scanned the never-ending rows of photos for ten minutes before I came face-to-face with Kowalski, down near the end of the hall. Kowalski is the second most popular surname in Poland. I can’t say I am related to that man. I can’t say I know anything about him. But that didn’t matter. These were more than just faces on a wall. I bowed my head and paid my respects to Mr. Kowalski, and every other face in that room recognizable by someone, related to someone, loved by someone. As I stepped from each cramped house of terror to the next, out of the horrors of yesterday, back into the reality of today, I realized how grateful I was for the strange change in weather. No blue sky, no yellow sunshine can erase the past. Even the most beautiful day can’t turn back time. It doesn’t lessen the blow, soften the punch. But it sure can remind you how precious life really is. Maybe that is what our tour guide takes home with her at the end of the day. Thank you, Tosh. You are helping us not forget.